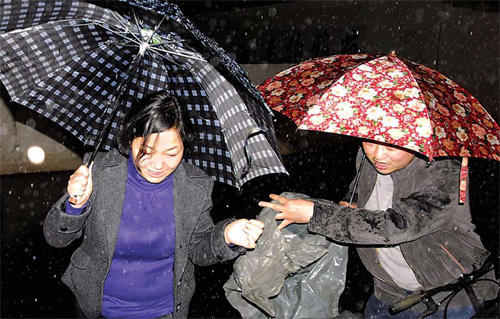 Xishuangbanna, Yunnan - Cloud seeding resulted in rain sweeping through Yunnan province over the weekend, though meteorologists said the light to moderate rainfall will have a limited effect on the worst drought in a century. Cloud seeding above the drought-stricken province induced drizzles, moderate rain and downpours in 11 cities and prefectures, including Kunming, Chuxiong and Xishuangbanna between 8 am on Saturday and 8 am on Sunday, Ma Lianxiang, chief weather forecaster of the provincial meteorological bureau, said on Sunday. More than 3,200 cannons and rockets loaded with cloud seeding chemicals were fired into the sky at 317 sites in 77 counties of 13 cities and prefectures, according to the China Meteorological Administration (CMA). "It was the first rain I have seen since last October, but it only lasted for about three hours from 3 am to 6 am this morning," Bu Lupiao, a farmer of Bapiao village in Jinghong county, Xishuangbanna Dai autonomous prefecture, told China Daily on Sunday. "The rain may do some good for the growth of tea seeds, which should have sprouted two weeks ago," he said. The lingering drought has cut the production of his 70 mu (4.7 hectares) tea and rubber plantation by up to 60 percent. Part of Xishuangbanna received up to 33 mm of precipitation, probably the maximum rainfall in the province, according to the prefecture's drought relief headquarters. However, in Chuxiong Yi autonomous prefecture, the area hit hardest by the drought, the 112 cloud-seeding cannons induced little rainfall on Saturday, frustrating local residents. "As the rain has not produced a flow of surface and ground water, it will not increase the water supply in either wells or reservoirs and the drinking water shortage will continue in the province," Ma said. The drought has ravaged southwestern China since last autumn, affecting 61.3 million residents and 5 million hectares of crops in Guizhou, Yunnan, Sichuan, Chongqing, and Guangxi, the Ministry of Civil Affairs said last Wednesday. The drought has also caused direct economic losses of 23.7 billion yuan ($3.5 billion), the ministry said. In Yunnan province, which has been the hardest hit by the drought, direct agricultural economic losses are estimated at 17 billion yuan and 8.2 million residents have been left short of food. The lingering dry weather has further affected over 80 percent of all planting areas in Yunnan, a major region for the production of fresh flowers, rapeseed, sugar cane, tobacco and tea.